business card in the world. To be remembered is a luxury only the select few can afford. 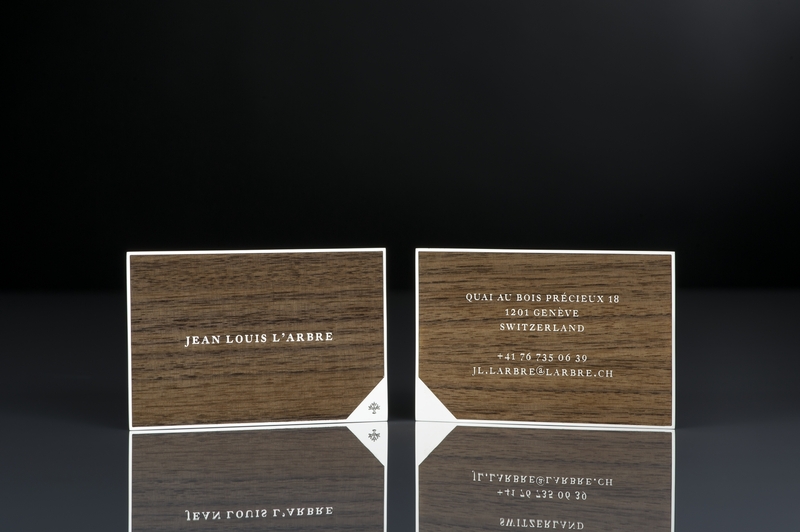 L’Arbre business cards guarantee a first impression to last a lifetime. 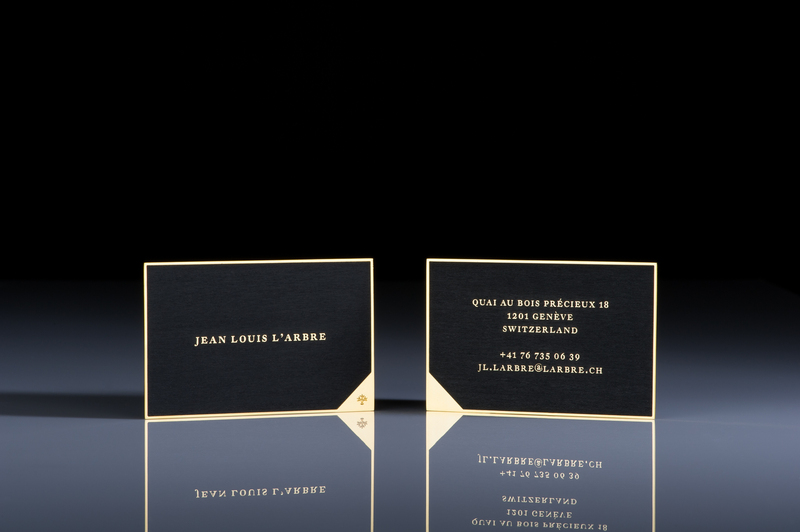 The core of each card is fashioned from polished gold plated premium steel or solid gold. 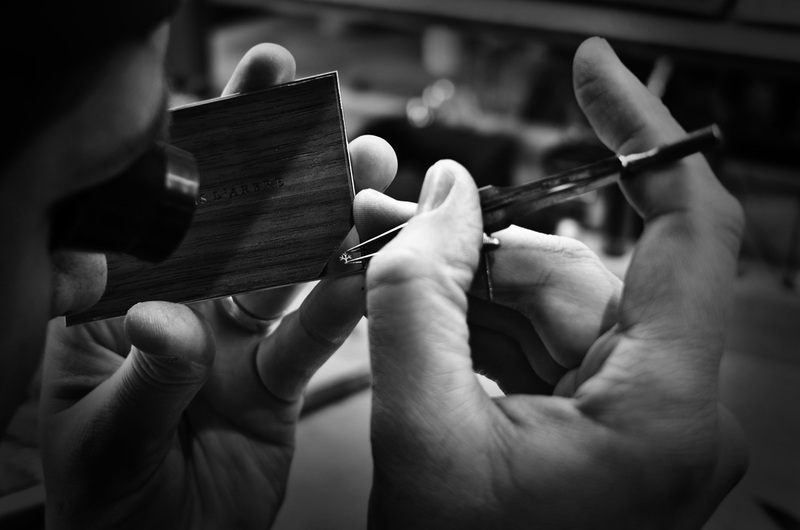 The name of the bearer shines through a layer of carefully selected precious wood. 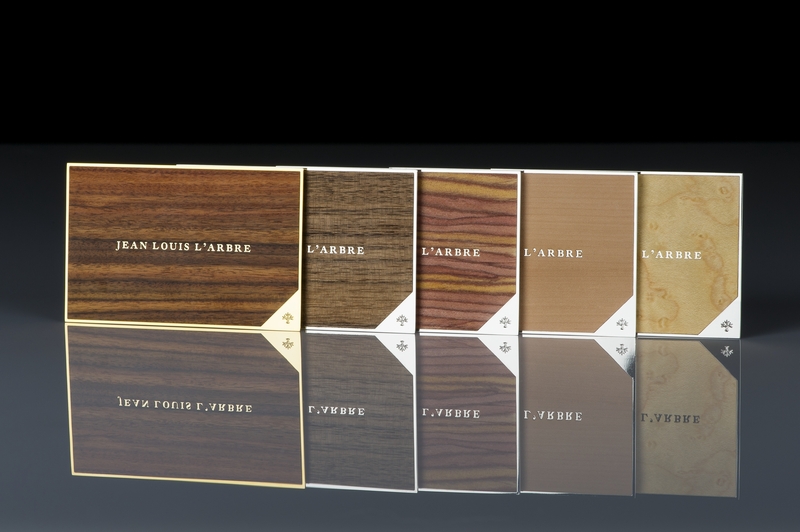 Each L’Arbre Card comes in a protective handmade paper cover. 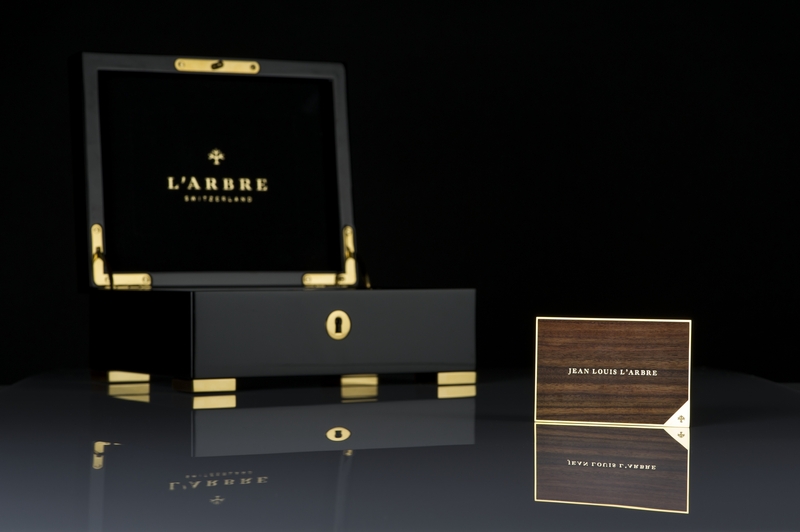 Each set is delivered in an elegant wooden presentation box with a quality certificate. 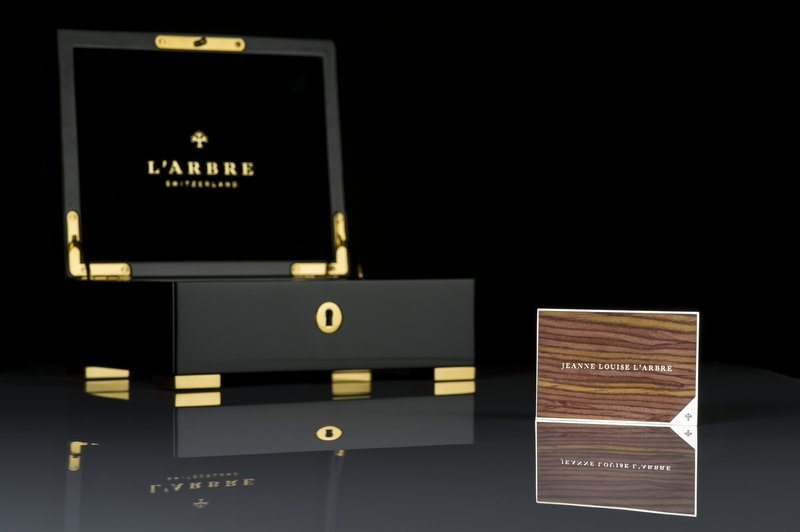 Manufactured exclusively in Switzerland, L’Arbre Cards embody the qualities the country is renowned for: precision, high quality, and master workmanship. 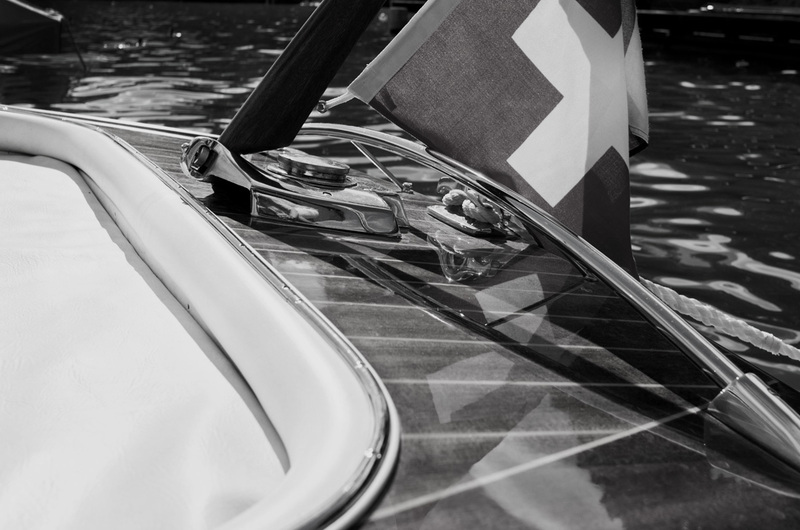 L’Arbre Switzerland AG is based at the foot of the Alps, in a picturesque region where people take pride in living according to traditional virtues, such as a sense of duty, solidarity, and accuracy. 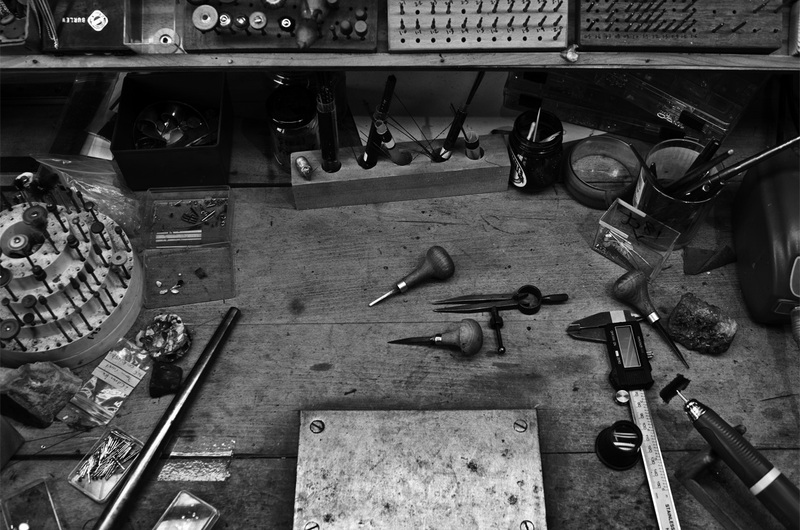 It is in these hills, steeped in Swiss traditions and know-how, that L’Arbre Switzerland develops and manufactures its precious and unique pieces for true connoisseurs. 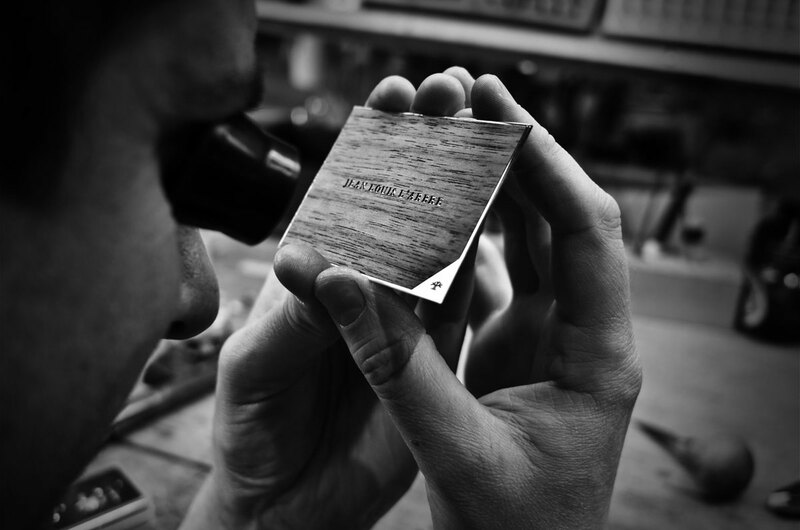 To create L’Arbre Card, we have brought together traditional Swiss master craftsmen: the individual elements of L’Arbre Cards are hand-made by selected goldsmiths, woodworkers, and papermakers. 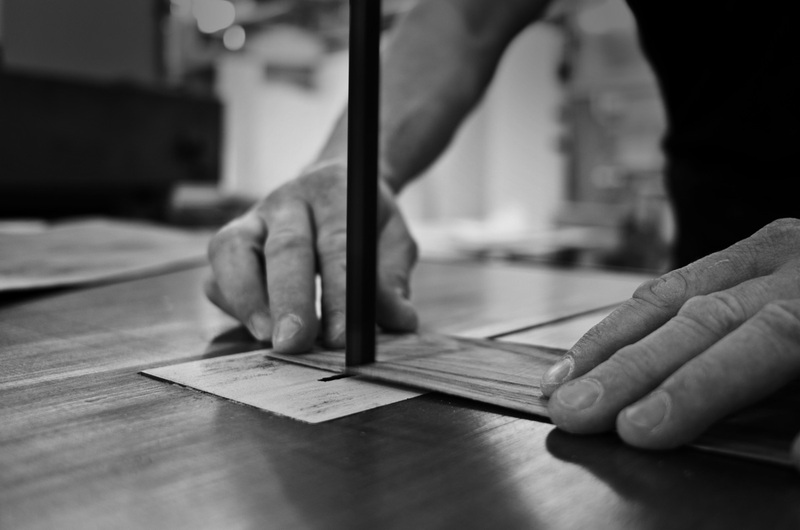 Their artisanal expertise and passion guarantee the quality and individuality of each L’Arbre Card. 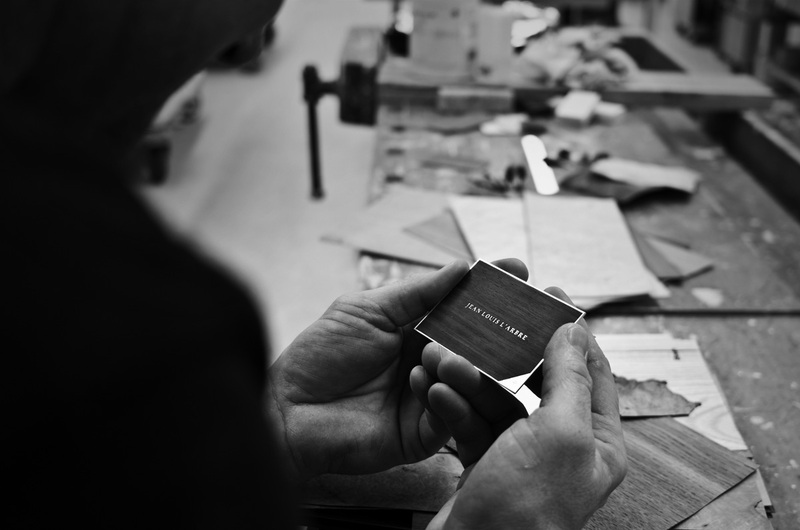 Before being sent out to our clients around the world, each card is subjected to a strict quality control. The lush brown wood of the Rosewood tree; the dark brown wood of the Walnut tree; the intricately layered wood of the Red Cedar tree; the gentle rose hued wood of the Checker tree; and the shimmering wood of the Birdseye Maple tree. A polished yellow, rose, or white gold plated premium steel core allows the cut out letters to shine through and impress even the most demanding of recipients. Each set is a true work of art created individually according to our clients’ wishes. 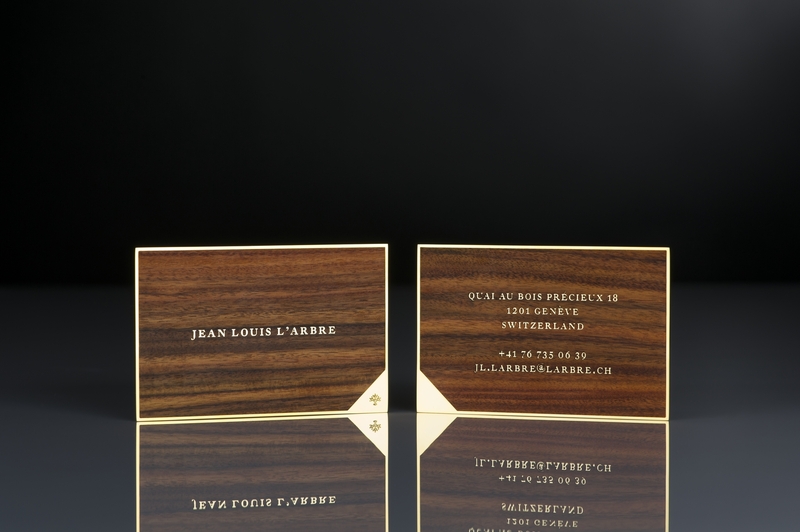 Les Royales L’Arbre Cards combine Black Tulipwood with a massive 18 or 22 carat gold core. 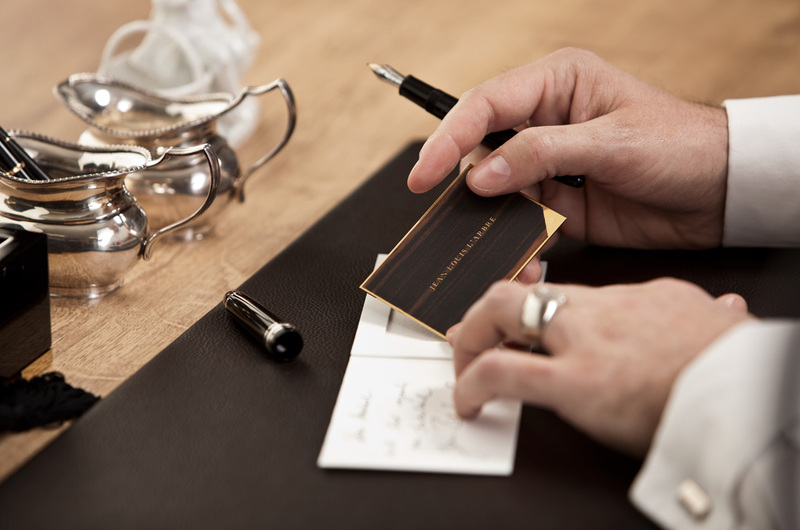 Each card can also be adorned with precious stones or personal engravings, turning an individually created work of art into an elegant masterpiece. Les Royales sets are handmade with great care to suit the the most stringent demands of our most exclusive clients. There are no standard L’Arbre Cards: they are individual, valuable, and possess their own character to suit their name bearer. 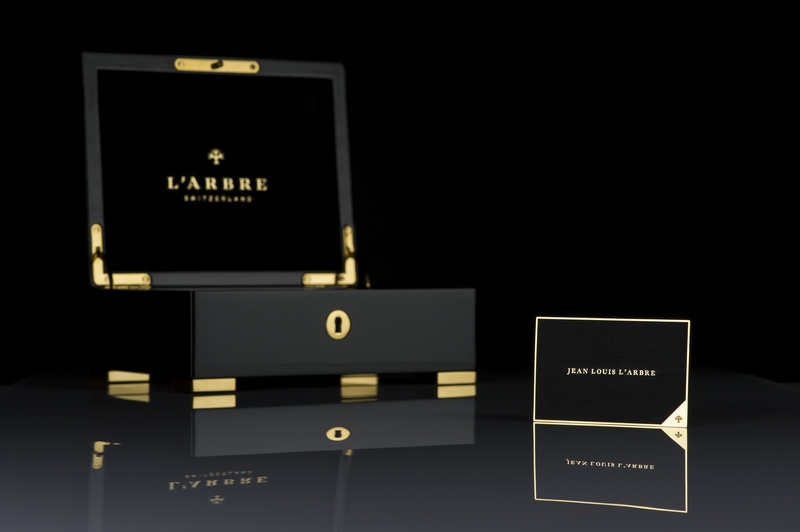 For this reason, we, at L’Arbre Switzerland AG, take personal inquiries only and provide you with expert advice when choosing your unique L’Arbre Cards. 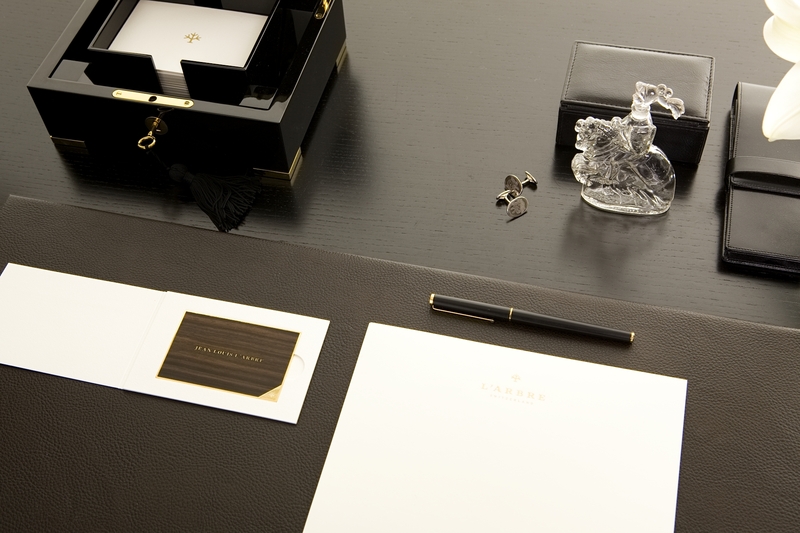 You may contact us at contact@larbre.ch or call us on +41 71 910 03 88 to arrange a personal consultation. All brands, trademarks, designs, and images shown on this website are the intellectual property of L’ARBRE SWITZERLAND AG. Any reproduction or use, even partial, is prohibited. The sale and service of all L’ARBRE SWITZERLAND AG products is performed exclusively by authorized dealers worldwide. We shall provide a list of distributors upon request. 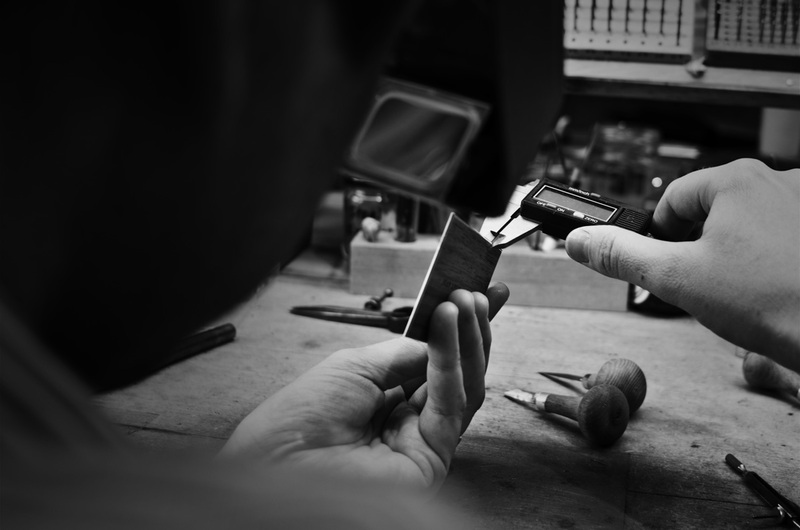 Should you decide to purchase from a source other than an authorized dealer, you do so at your own risk and without any warranty from L‘ARBRE SWITZERLAND AG. 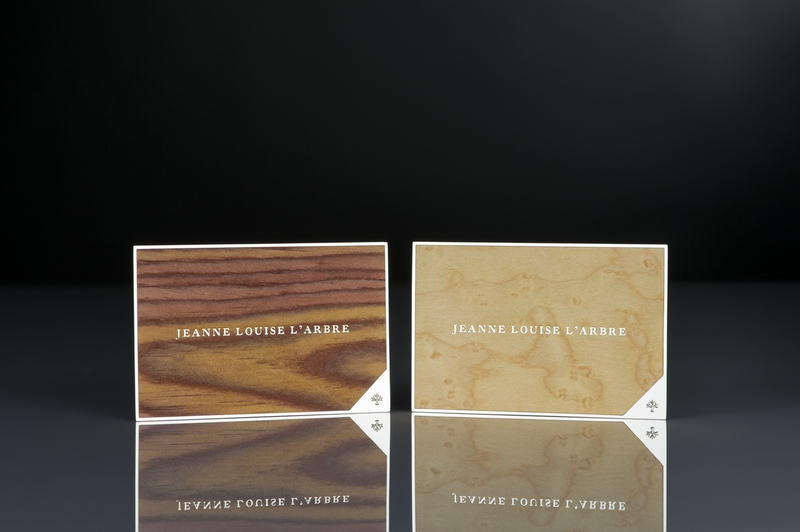 L’ARBRE Cards are made exclusively from natural materials. As such, they are subject to a natural aging process and are not resistant to environmental stressors, such as humidity or temperature fluctuations. 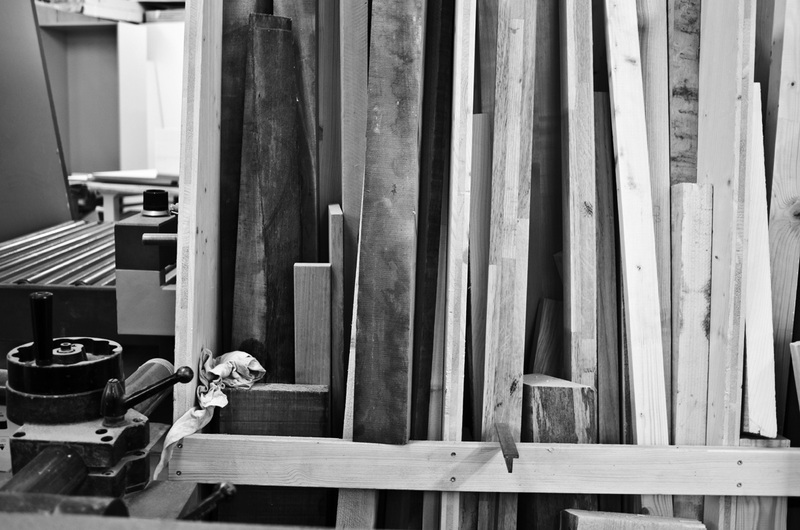 Solid woods are generally durable and easy to maintain. 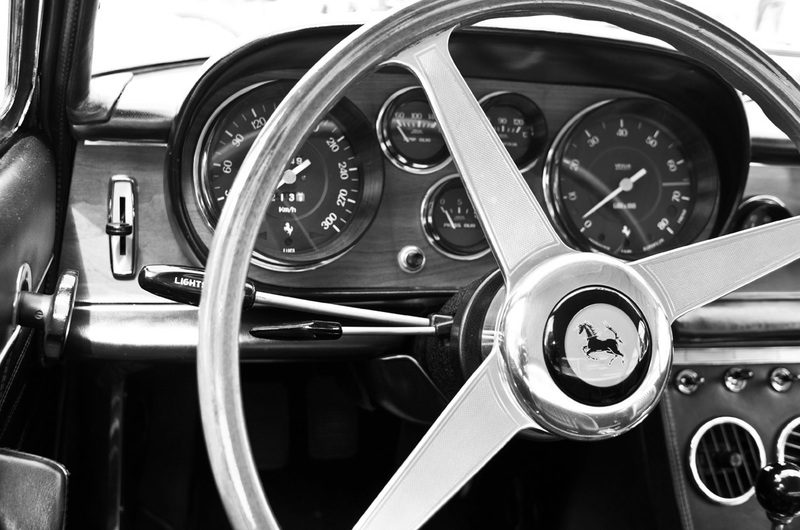 For additional protection, we offer a petroleum-free natural oil to preserve the natural splendour of the wood. L’ARBRE SWITZERLAND AG | Bachweg 5 | 9125 Brunnadern | Switzerland.